Hospital building in Scotland in the 1940s proceeded at a pace scarcely equalled anywhere in Europe, before or since. It began in 1939 as a UK scheme for expected civilian casualties in air raids. Scotland was also important as the likely refuge for British resistance if Hitler had invaded the south of England. Unlike their counterparts in Whitehall, Scottish civil servants had more than three decades’ experience of directly running health services – in the Highlands and Islands. They went to work with gusto. 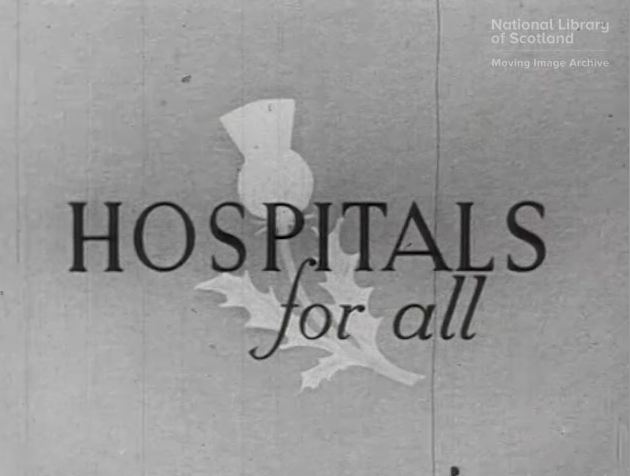 Seven new hospitals were constructed at Raigmore (Inverness), Stracathro (near Brechin which still thrives today), Bridge of Earn (Perthshire), Killearn (Stirlingshire), Law (Lanarkshire), Ballochmyle (Ayrshire) and Peel (Selkirkshire). They drew the attention of the German air force – Law and Stracathro appeared on Luftwaffe maps mistaken for military barracks. New annexes were also built at existing hospitals. And the plushest hotels were brought in to provide convalescent beds. Gleneagles was turned over to injured mineworkers, much to the delight of Secretary of State, Tom Johnston. The expected air raid casualties did not materialise. Johnston, building on the work of his predecessors, then pulled off a stroke of genius. Rather than leave the new hospitals empty, he put them to good use. A whole new range of specialities were established – seven orthopaedic centres with 2000 beds, and a further 1300 for plastic surgery, eye injuries, psychoneurosis, neurosurgery and other areas. A pathology laboratory service was established and in 1940 the Scottish National Blood Transfusion Association was set up to co-ordinate and develop existing transfusion services. Johnston then approved a scheme for civilian patients facing long waits for surgery. Nearly 33,000 were treated by the end of the war. He was even bolder with the Clyde Basin Scheme. Launched in January 1942 this unique experiment in preventative medicine was judged a great success and extended across Scotland. Round the clock shifts had left many industrial workers exhausted and approaching mental and physical collapse. Prevention was deemed better than cure to maintain the war effort. Under the scheme more than 22,000 civilian workers had been referred to GPs then, if necessary, to EHS hospitals, by the end of the war. In total the EHS provided an additional 20,500 beds – an astonishing 60 per cent increase on Scotland’s existing provision. Of these, 13,000 were later brought into the NHS. From severe pre-war bed shortages, Scotland by 1948 had a relative abundance – 15 per cent more beds per head of population than England and Wales. It also had 30 per cent more nurses and was already better resourced for GPs. The Treasury funding formula for the NHS incorporated the EHS hospitals and their staff. This was a significant benefit for Scotland. "Scotland had a flying start with the NHS revenue allocations because the running costs of the EHS hospitals – disproportionately located north of the border – were fully met in the initial provisions of the service." Source: Morrice McCrae, The National Health Service in Scotland, Origins and Ideals 1900-1950.